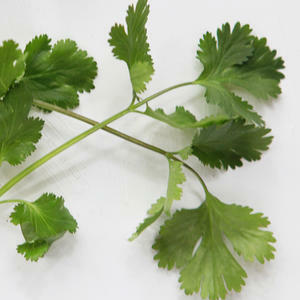 It is also known as coriander, though in the US, coriander generally refers to the dried seeds of the cilantro plant. Cilantro is a powerful, bright, almost citrusy herb. Interestingly, those who say they hate cilantro aren't just being picky- to some people, due to a genetic quirk, cilantro tastes like soap. Cilantro is often used in Latin, Caribbean, and Asian dishes, typically chopped and sprinkled on spiced dishes just before serving. Americans refer to coriander by the Spanish "cilantro" because our first widespread use of the herb came via Mexican dishes. Cilantro has a very distinct smell and taste, though at first glance it's virtually indistinguishable from parsely (so be sure to always read your labels). Cilantro stems can be chopped and used just like the leaves, or you can add them whole to simmering soups, stews, and broths for a punch of extra flavor. Like most herbs, cilantro is highly perishable, so if you don't plan to use it within a few days, store it stem-down in a glass of refrigerated water.